I went to this plant swap 2 years ago and it was terrific. I have no idea how many readers of this blog are within driving distance but if you are check it out. Here is the info on this years swap. I’m doing this post from my phone for practice on the trail. 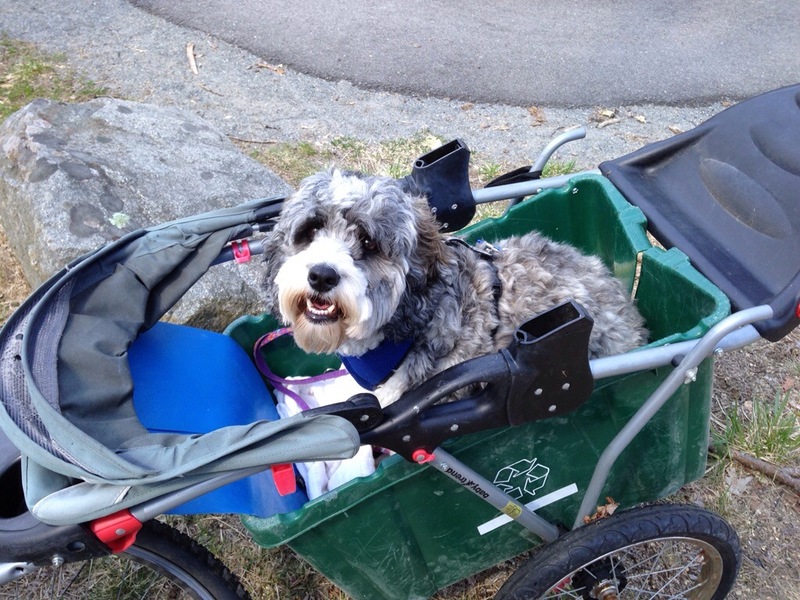 Took Wrigley out for a bike ride “maiden voyage” with the doggie hauler I made from an old jogging stroller. 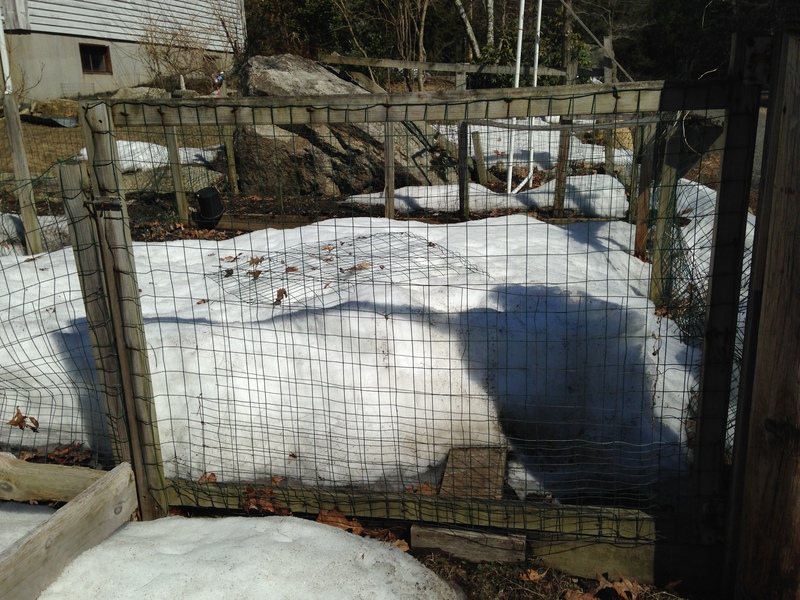 Huge snow pile is just about gone. 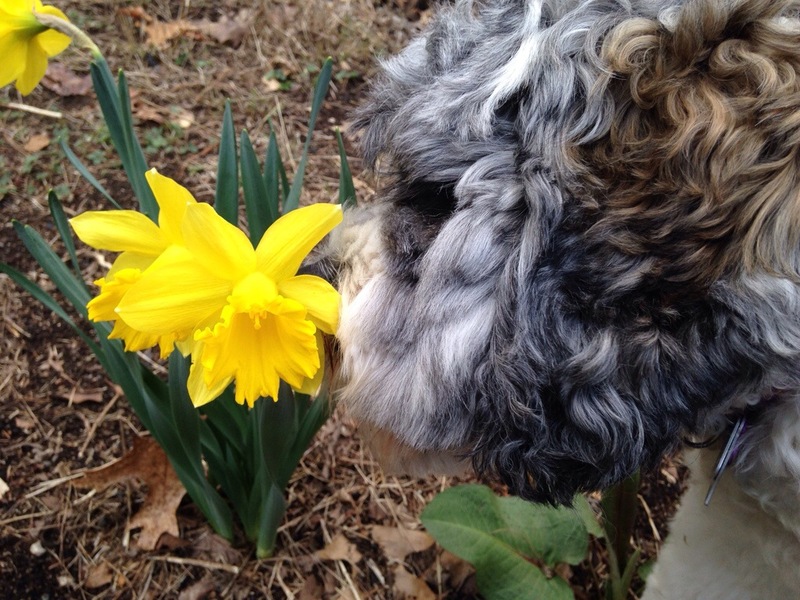 We have some pictures of spring. 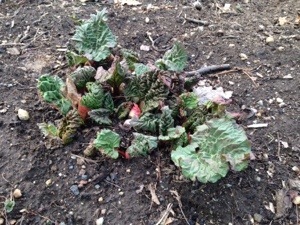 Garlic, rhubarb , daffodils and skunk cabbage. 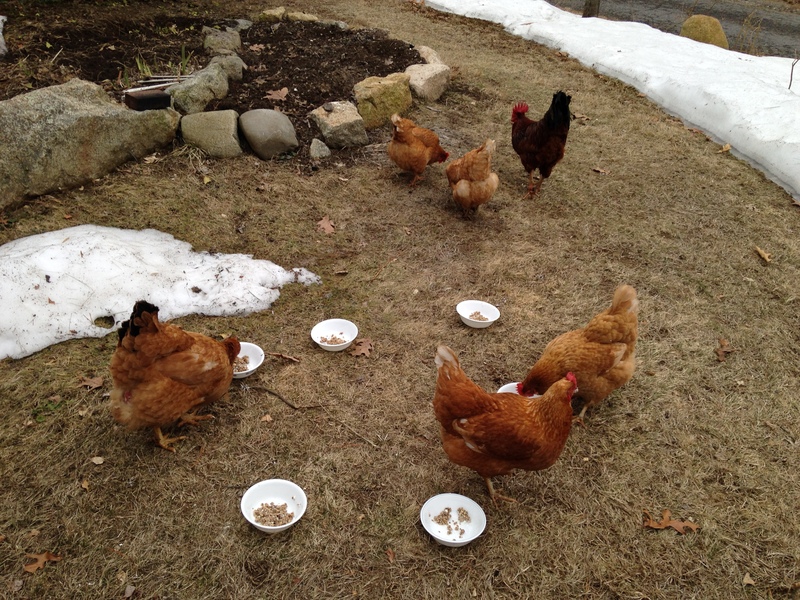 April, 3rd, Lil prepared 6 bowls of goodies for the chickens to celebrate their 3rd hatchday. 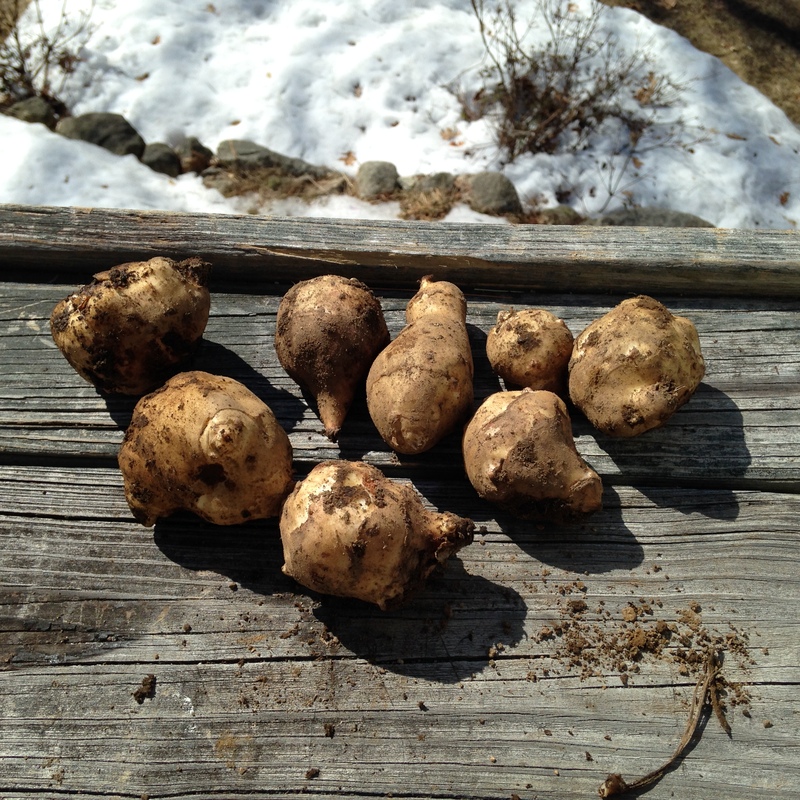 For Easter Sunday dinner, I dug up some sun chokes. I’m not sure if this is the last harvest from last year or the first harvest from this year. Lastly, pictures of the east and west gardens and the uncovered chicken run. Note the snow. Also note the destroyed fencing of the east garden, there were a group of deer that took it down trying to get out late last fall. 4/5/15 going in for the night. Personal note, I’m going back to the Appalachian Trail for a month or so, starting April 30th. I’m now a section hiker. I’ve been away from my blog, lets see if this dinosaur can remember how to post. 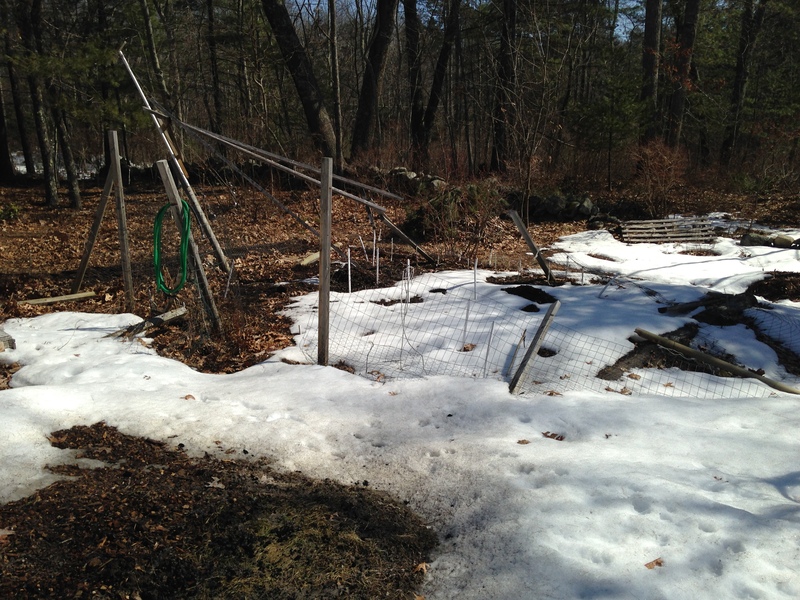 This post will try to fill in what has been happening in my back yard these past many months. I did something for Thanksgiving, that I haven’t done since my Ladies started laying eggs. I BOUGHT EGGS at the supermarket. 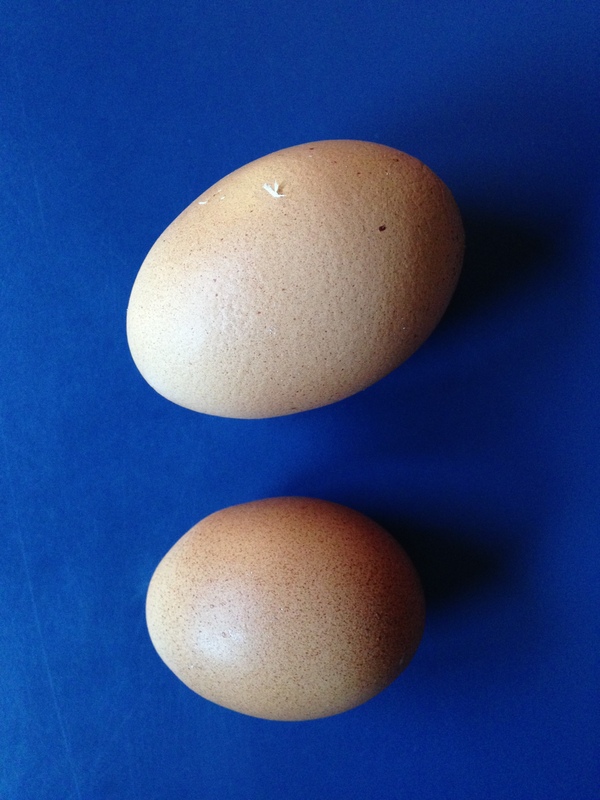 After laying over 3,000 eggs my hens have cut way back on the number of eggs they are producing. Partly because they are getting older, it is getting colder, some are molting and the loss of Miny. Some days I’d get 1 or 2 eggs but most days I wouldn’t get any. 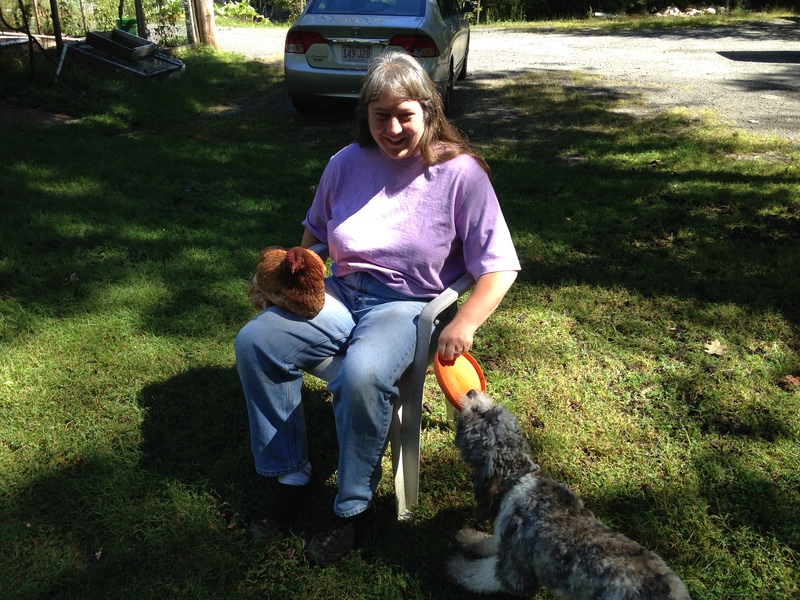 My wife and I said from the beginning that the chickens were pets and we would keep and care for them even when they stopped laying eggs. So we buy eggs. I’ve forgotten how pale and tasteless the store bought eggs are. Shortly after Miny went to that big farm in the sky, my son asked me if we would take in his girlfriends last chicken. 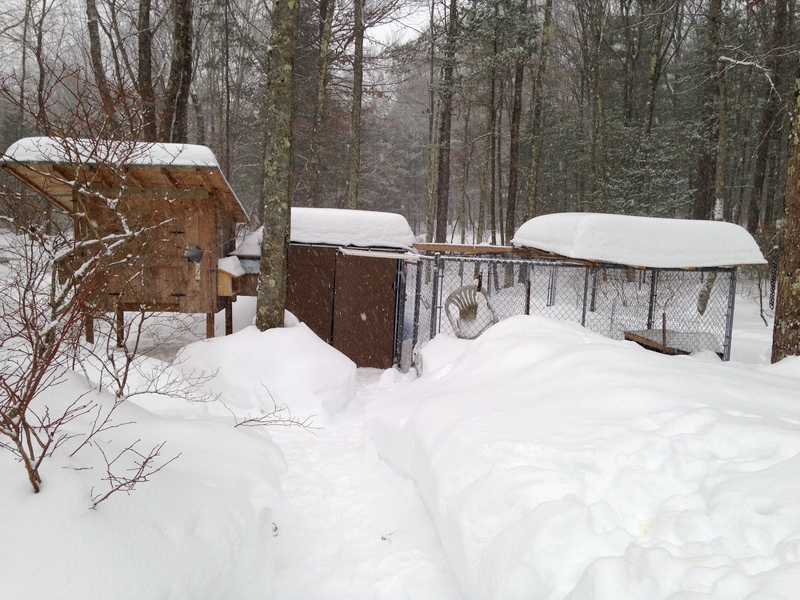 They had a pair of chickens for quite a while but only one returned to their coop after free-ranging one day. I said yes but if she didn’t integrate nicely he would get her back. I had the “cottage” set up for Miny still, so Holly was put in there. 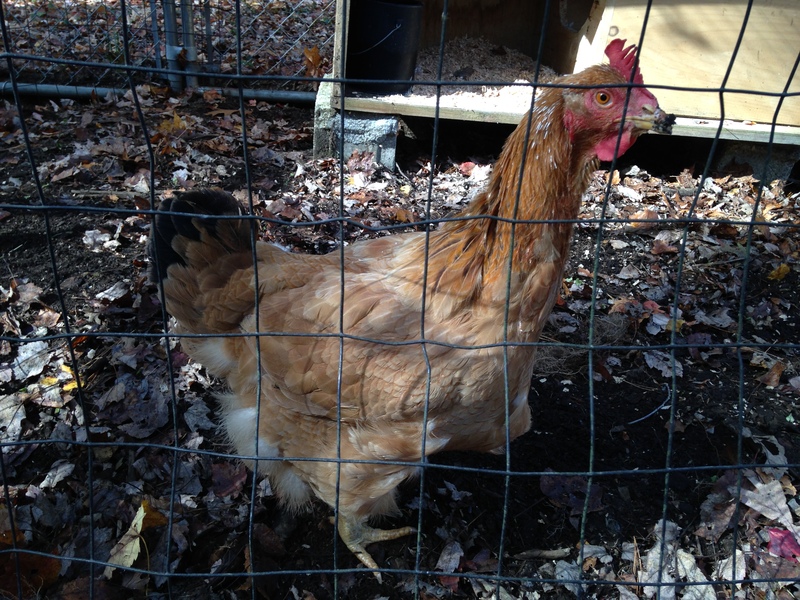 She was separated from the other chickens by a wire fence. They still tried to attack each other thru this fence. 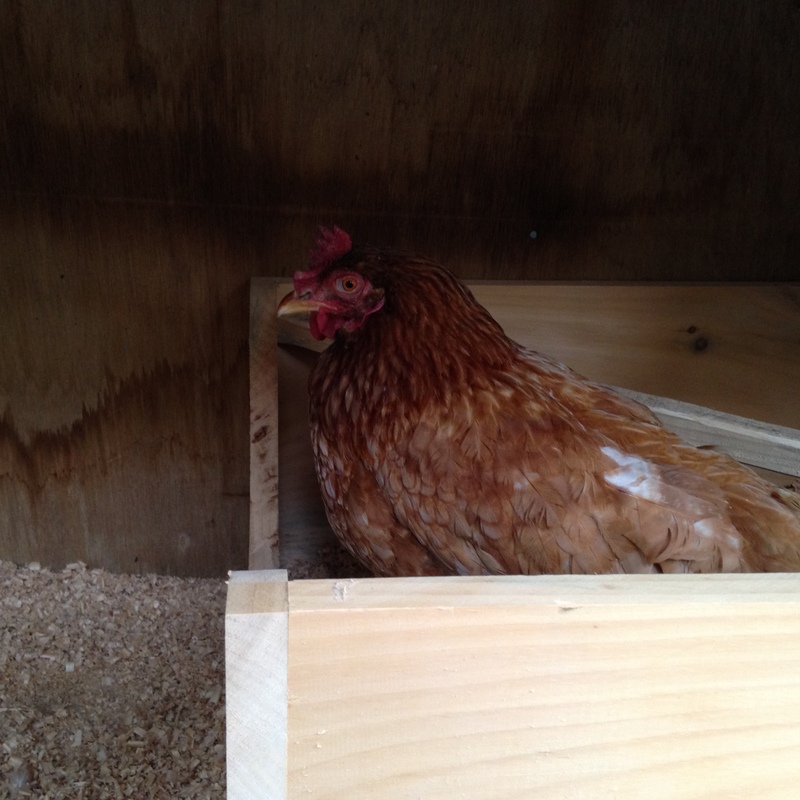 With colder nights coming we really needed to get Holly into the coop. So after a couple of weeks with the fence between them we started letting them out in the yard together. 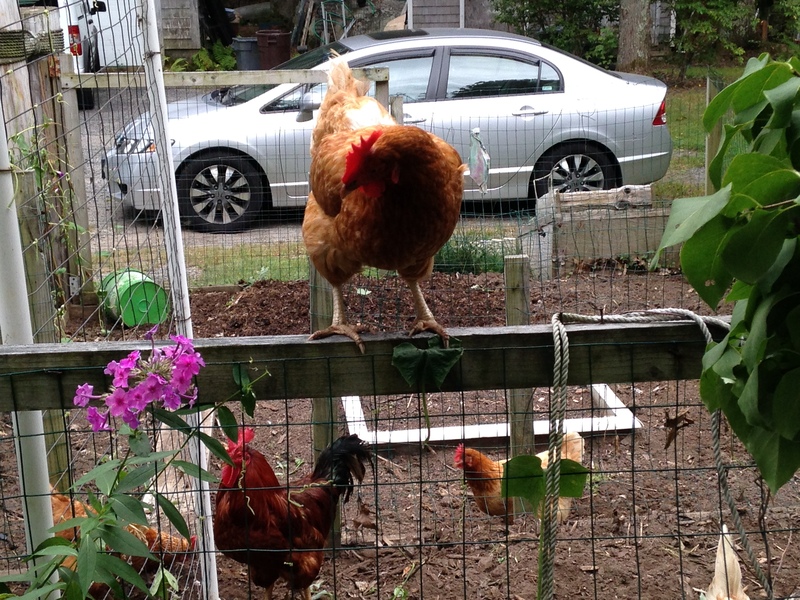 Holly was chased and pecked at a lot by all of the ladies. She learned to keep her distance. This got better as time went by and one cold night Lil and I just put her in the coop with everybody else. They have worked out the pecking order, Holly is at the bottom. Mini is happy not to be at the bottom anymore. Actually she goes after Holly more than the rest. This is a bit comical because Holly is twice the size of Mini. 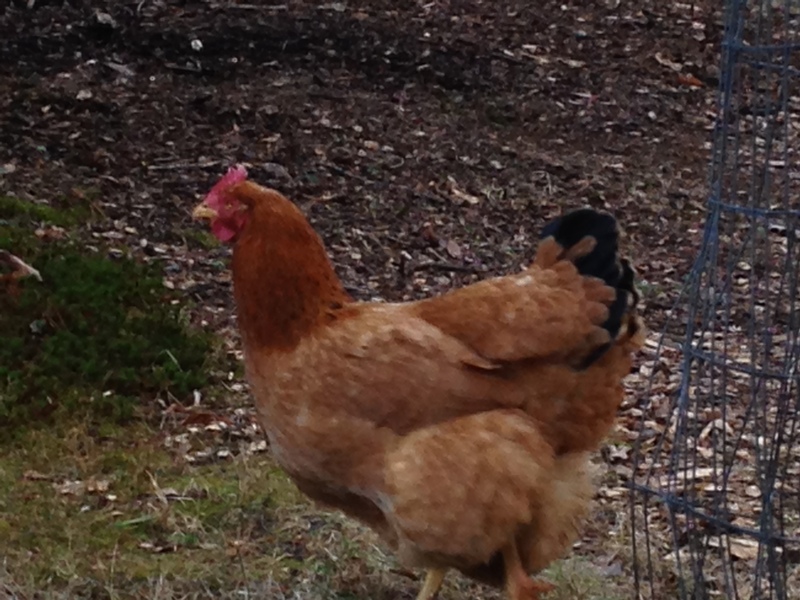 When we first got Holly she was molting and not looking her best. She is now fully feathered and quite a good looking lady. 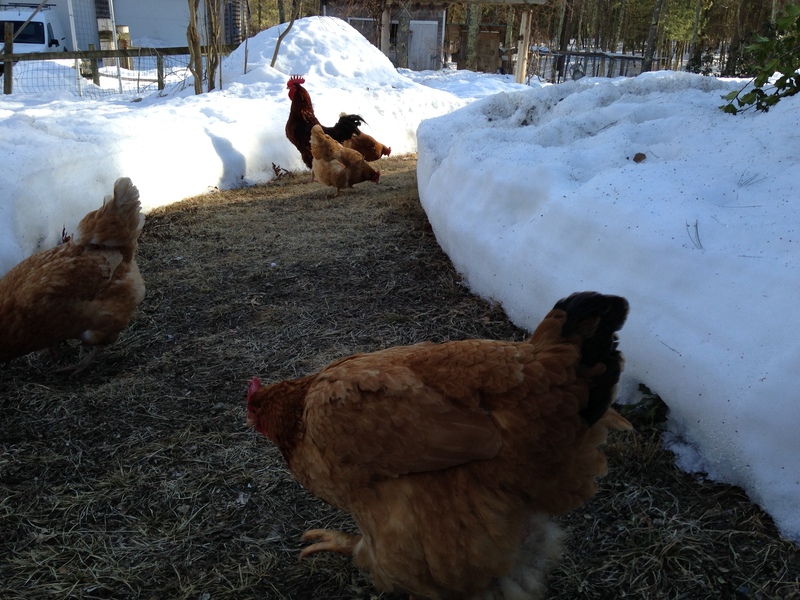 All of our chickens are fully feathered this winter GOOD THING because this has been quite a winter. My son didn’t think Holly was laying eggs anymore when we got her. 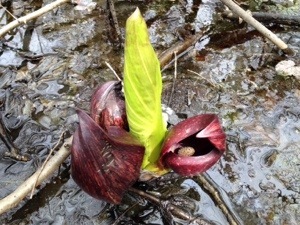 But earlier this month (March) she started to lay eggs. I can tell they are Holly eggs because they are a very light color, my flock all lay brown eggs. Holly being the largest hen lays the smallest egg, go figure. With spring trying to get here and the days getting longer the ladies are producing more eggs and we haven’t had to buy any recently. Now some pictures. Clicking on them makes them larger. I’m about 25 miles west of Boston MA. We have had a lot of snow and very cold temperatures for us starting the end of January and still going. 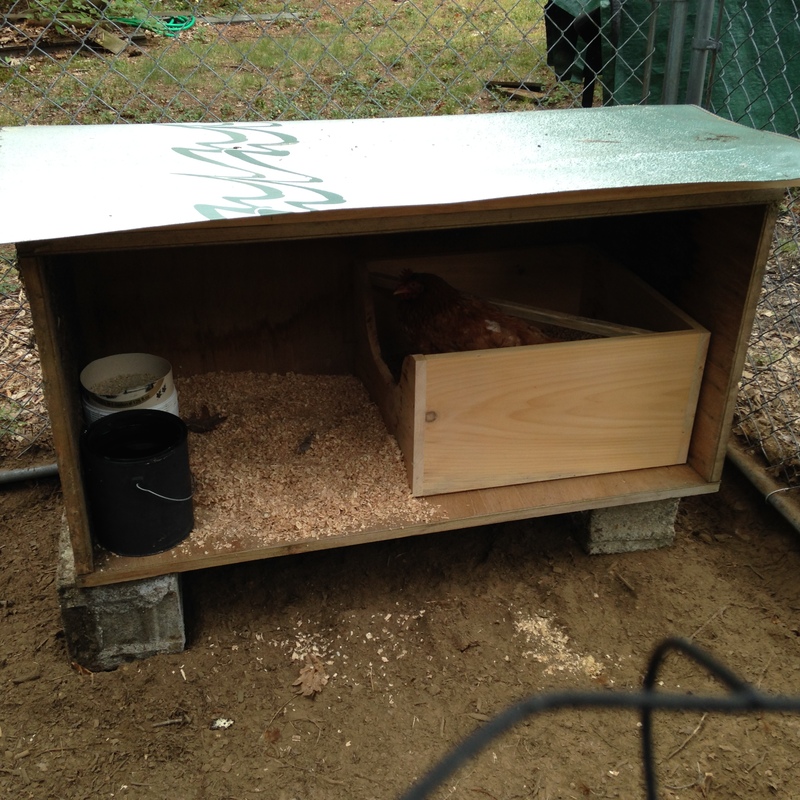 1/20/15 Chicken by the corner of the house. Very little snow. 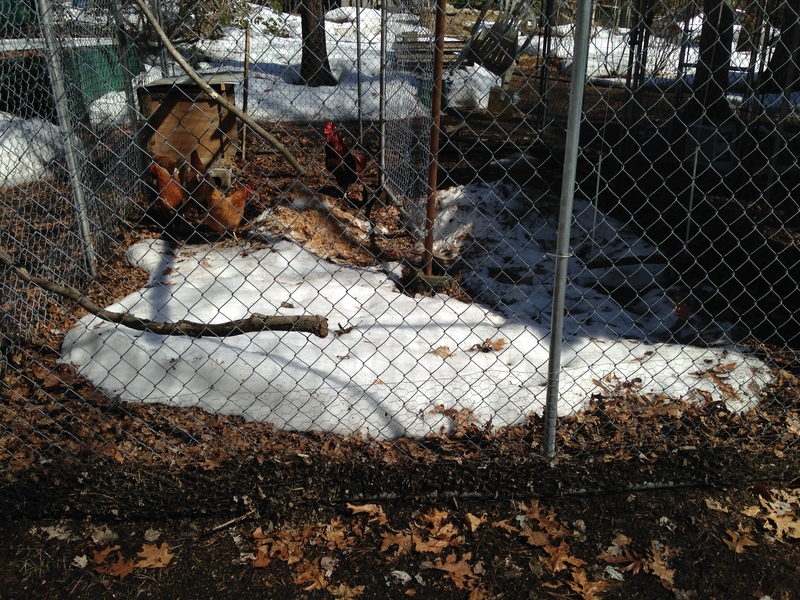 3/19/15 Chickens out in pathway. Holly in front. 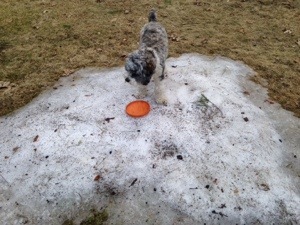 Still too much snow. My grandson is learning about 3-D printers at his high school. Me, I remember the mimeograph machines from my high school. And we didn’t learn about them, maybe we got to turn the crank. 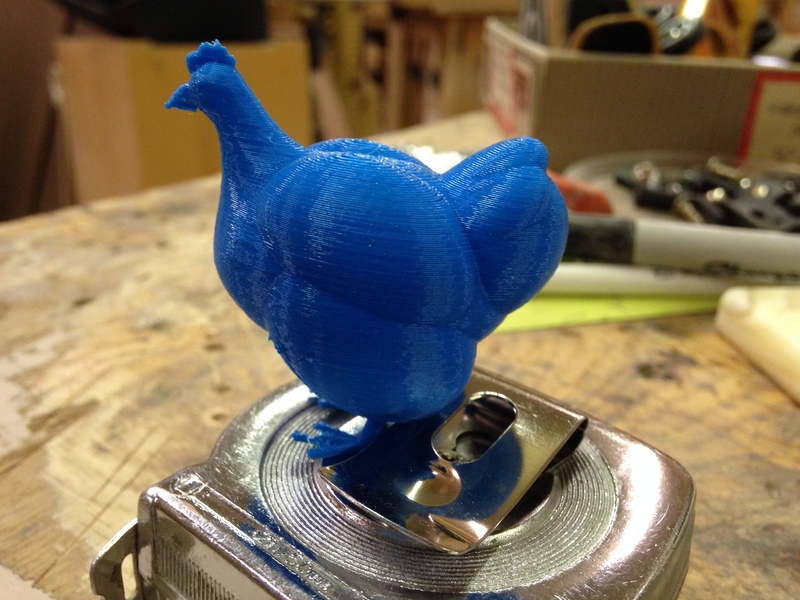 Well, Alden made me a chicken with this 3-D printer. Some days I’m more of a dinosaur than others. 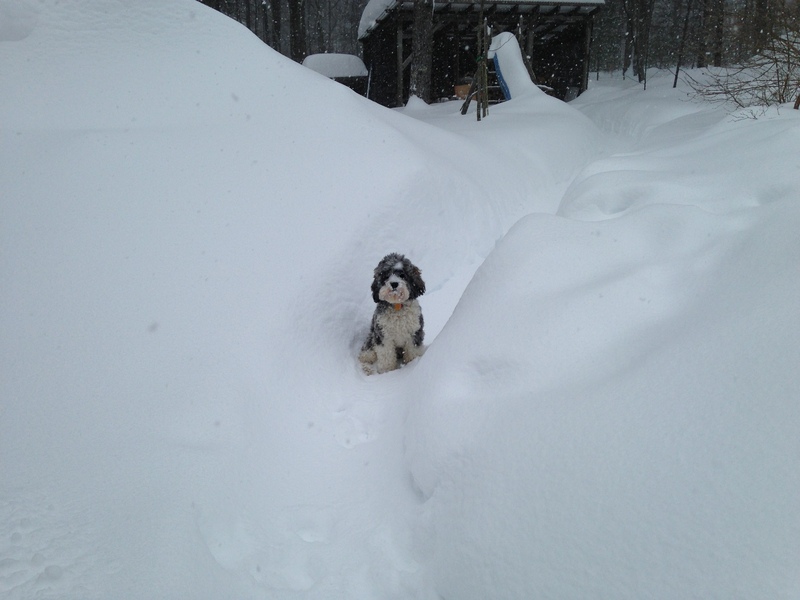 With all of this snow I haven’t really started doing anything about my garden. Three thousand is a pretty large number, well depends on what the 3000 represents. Compared to the number of leaves I will have to rake this fall, it’s not very large at all. Compared to the balance in my checkbook, it’s rather sizable. But this is a blog about my garden and my chickens——-NO it isn’t the number of tomatoes I harvested this year (actually I didn’t plant any) and I’m not expanding my coop and run to accommodate 3,000 new chicks. I’m writing about eggs. On April 4th 2012, I brought home 6, one-day-old chicks. 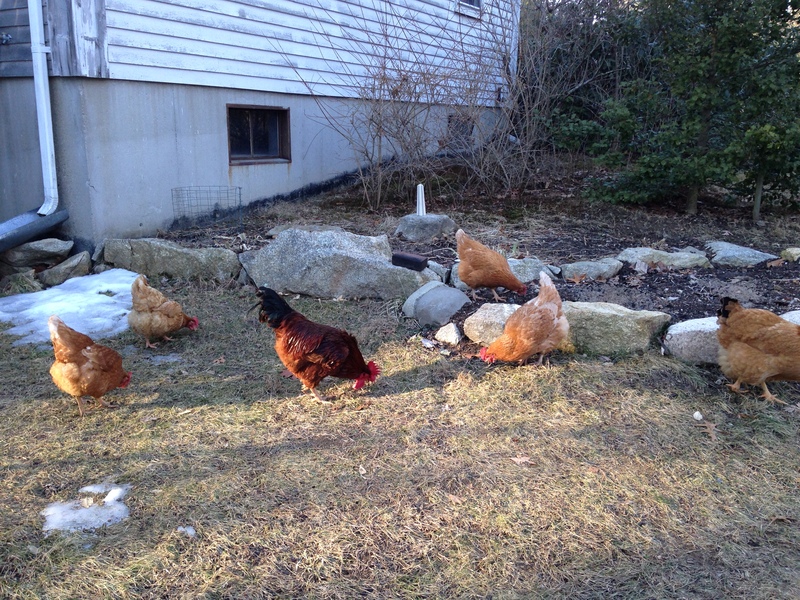 5 hens and one surprise rooster, Jack. On August 4th 2012, I got my first egg, 220 days later on March 12th 2013, the count reached 1,000 eggs, 223 days after that on October 21st 2013, 2,000 eggs and 310 days later, on August 27th 2014, 3,000 eggs. They are slowing down with the egg production. 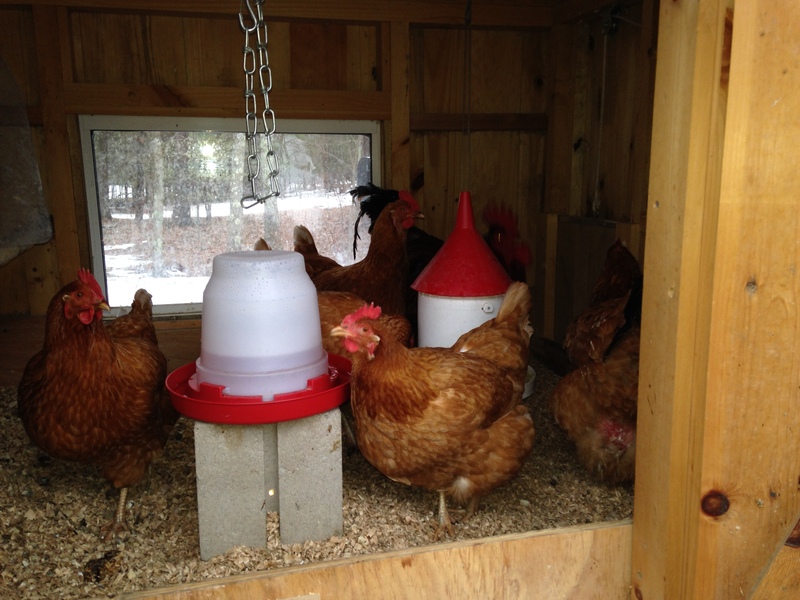 When they first started the ladies would average better than 4 eggs per day, for the last 3 months they are averaging less than 3 eggs per day. Some of the reasons they are slowing with their egg production are, they are getting past their prime laying age, some of the time they are molting and Miny has been sick. 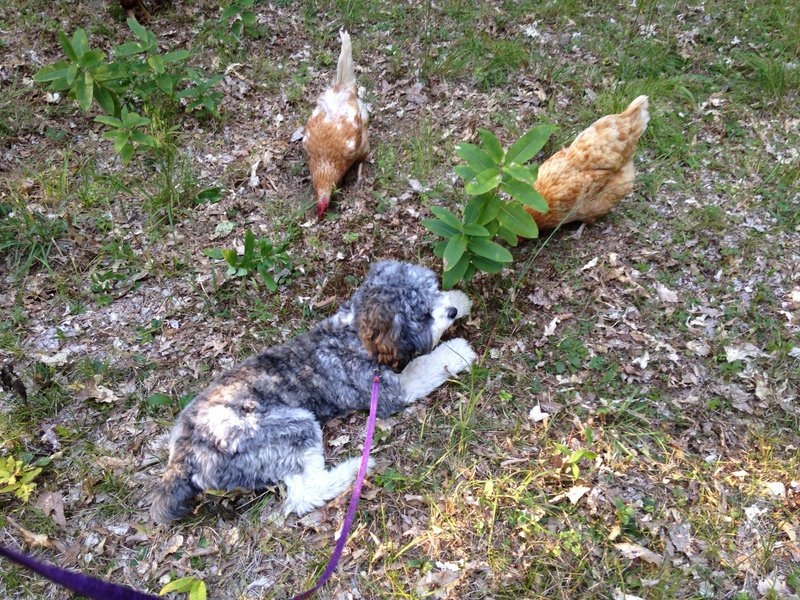 While I was off on my hike, Miny stopped acting like a chicken. She wasn’t interested in food, she wasn’t scratching about and she would spend most of the day sitting in a corner of the run. She was very lethargic. My wife, Lil, who I affectionately call the “chicken whisperer” hand fed Miny, yogurt and treats, massaged her crop because it wasn’t emptying and was very squishy. She gave her olive oil to help move things along by eye-dropper daily. Some days Miny seemed better and some not so. Lil took her to our vet twice. On the second visit the vet operated on her crop and cleaned it out. No perceivable blockage was found. Miny then spent some time in the crate in the kitchen recuperating. 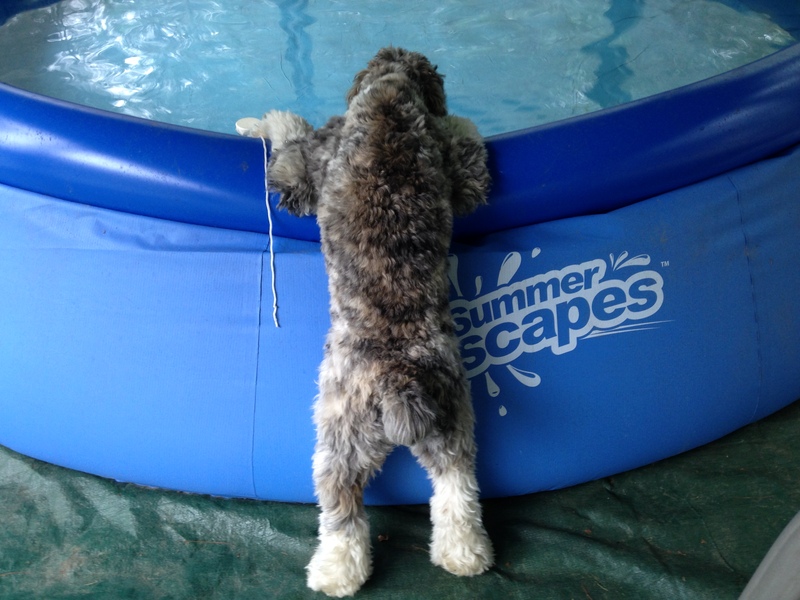 Wrigley (the cutest puppy on the planet) did not make this a relaxed stay for Miny. When I got back home later into May, Miny still wasn’t acting well, actually getting worse. We took her to another vet that specializes in birds of all kinds. The vet didn’t think Miny’s insides felt right so she did an ultra-sound and took x-rays. Miny has a tumor, a mass in her that is crowding her organs. We brought her home with very heavy hearts. Glad to have an answer, just not happy with it. We decided to make her as comfortable as possible, Both of us thought we would be burying her over the July 4th weekend. Lil had read someplace about high doses of vitamin-C shrinking tumors——-so—-she started giving Miny daily eye-droppers of high dose vitamin-C. Miny started getting better. 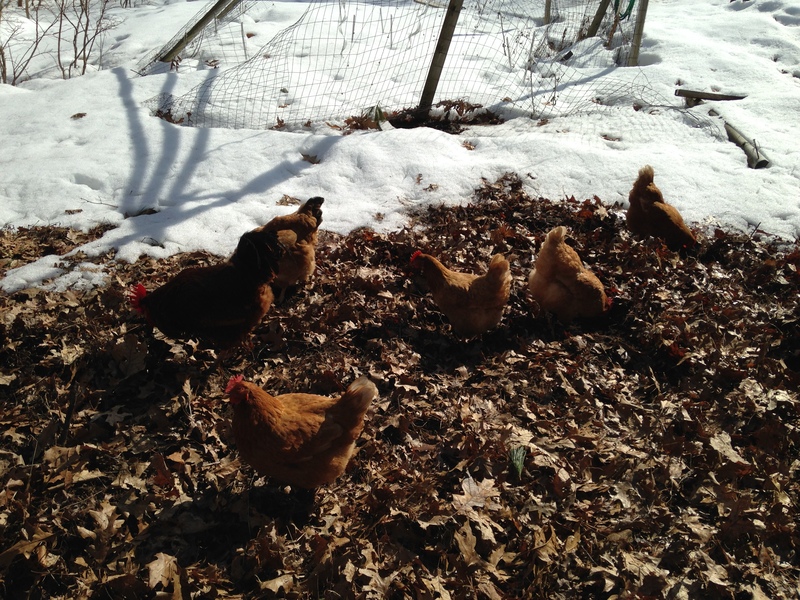 There were days when she acted like a chicken, out in the yard scratching away with the flock. We were both very hopeful. BUT, in September she started being lethargic again and I watched one day as Mo and Jasmine rather viciously attacked her. I separated them and put Miny in the old run by herself. NOW WHAT??? I fenced off a section of the new run and set up a little “cottage” for Miny. Again she would have some good days and some not. 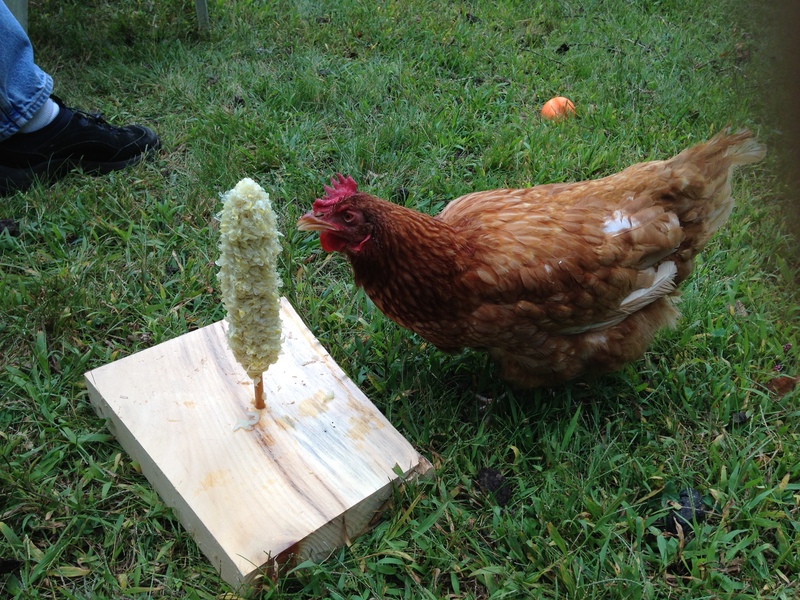 Lil was still hand feeding her everyday, I made her a separate corn-cob feeder for her cottage. Miny with feeder. 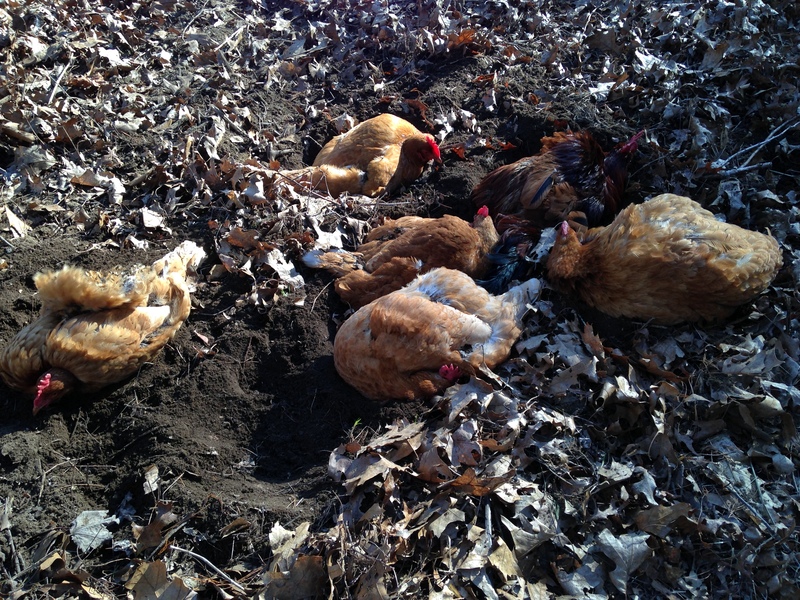 The chickens love corn on the cob, I don’t like just throwing them into the run and the dirt. I drill a hole in them and stand them on dowels. Miny went to that farm in the sky September 20th 2014. We buried her at the base of a large rock in the back yard. Not quite 2 1/2 years and we have lost our first chicken. We have always tried to be good custodians of our flock, Lil, maybe more than I. Lil would have them live in the cellar under the stairs when it gets cold out side, me, not so much. We hope our chickens know this, that they are spoiled BUT who knows what goes on in the mind of a chicken. This recipe is from King Arthur Flour with some modifications. I make my dough in a Kitchen-aid mixer with a dough hook. I do finish the kneading by hand. pretzel salt or pearl sugar or cinnamon-sugar and melted butter. I just sprinkle with sea salt. Whisk together water yeast and sugar. Add remaining ingredients and mix at low speed until dough is smooth and slightly sticky. If it is too dry add cold water 1 Tbs at a time. Knead by hand on a lightly floured surface, form into a ball. Place into a bowl with 1-2 Tbs olive oil and roll-around till ball is coated. Cover bowl with dish towel and let rest in a warm spot about 30-40 minutes ( dough should double in size). Deflate dough (punch it), on a lightly floured surface Divide into 8 pieces. Roll each piece into a 20″ rope. Shape each rope into a pretzel. Mix together Wash (water, sugar and baking soda) in a shallow bowl. Carefully dip into wash flipping to coat all. Place pretzels on to a backing sheet ( I lightly sprinkle sheet with corn meal). At this point if I remember I sprinkle with sea salt. They may be placed into a preheated 400 F oven now, I like to let mine rest before I bake them for 10-20 minutes to get a softer pretzel. Bake in a preheated 400 degree F oven for 12- 15 minutes until golden brown. Remove and brush with belted butter and sprinkle with cinnamon-sugar ( I don’t do this). This part might not be good for my heart, but it tastes SO GOOD. I melt a half stick of butter to dip my warm pretzels in. These are great with any soup. 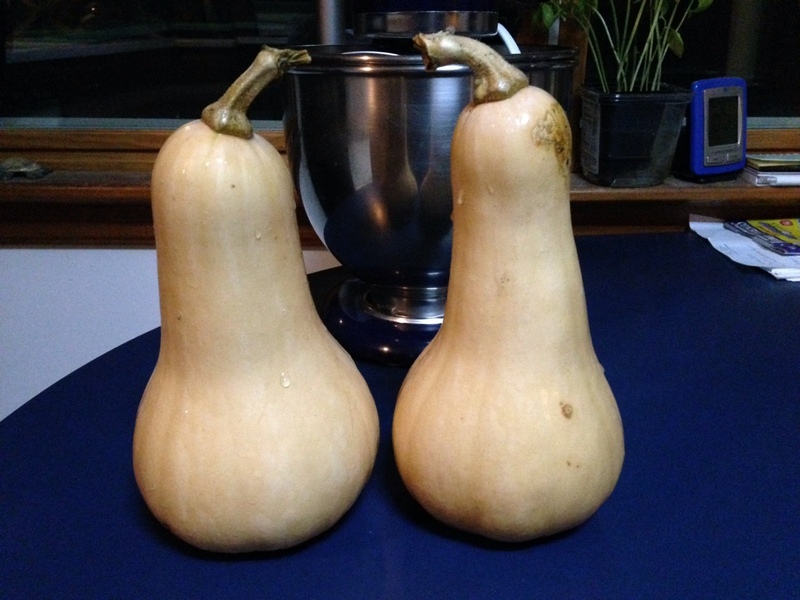 Yes, this is the end of the butternut squash. 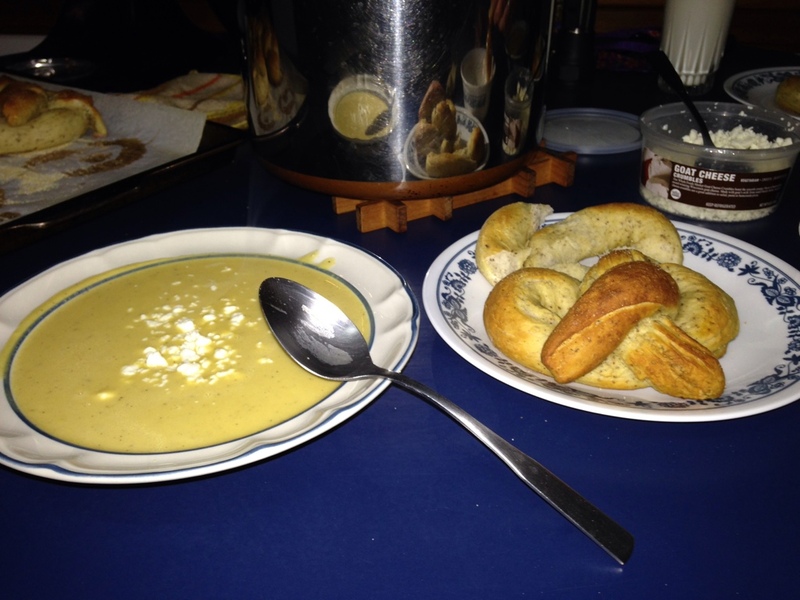 I made my roasted butternut soup last night with my last two. Made fresh soft pretzels to go with them. This also may be my last post to this blog until I am back from my hike. Helping gardeners get the most bang for their BAWK!